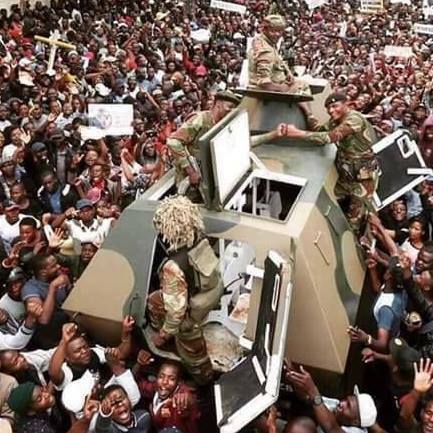 ZIMBABWE MILITARY REMOVED MUGABE, BROUGHT BACK MNANGAGWA FROM FORCED EXILE, and stopped police from arresting now Rtd Gen Chiwenga the Vice president under the orders of a few securocrats, the real power behind the Operation Legacy coup. ‘FIVE MDC ALLIANCE OFFICIALS AND NINETEEN SUPPORTERS APPEAR AT HARARE MAGISTRATES COURT ON CHARGES OFPUBLIC VIOLENCE’ over the alleged delay in releasing Zimbabwe’s presidential election results. ZIMBABWE POLL RESULTS ARE GENUINE SAYS retired Justice Johann Kriegler (85), SA head of the Independent Electoral Commission (IEC), which oversaw the first South African democratic election in 1994. ZIMBABWE’S VICE PRESIDENT EMMERSON MNANGAGWA also the Minister of Defence, Security and War Veterans , is the man who led the November 2017 Operation Restore Legacy coup which forcibly removed the despot president Robert Gabriel Mugabe from power. BREAKING NEWS: EMERSON MNANGAGWA DECLARED THE NEW ZIMBABWE PRESIDENT-After a long wait, no surprise to anyone, Zec has declared Emmerson Mnangagwa as the new president of Zimbabwe with a 51% victory against Chamisa 44 %.